Hey guys! 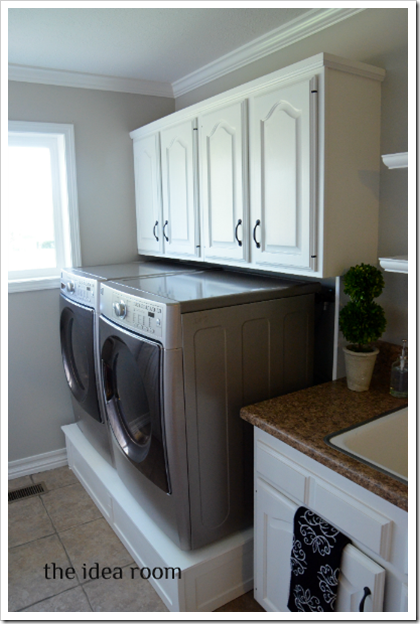 I am so happy to be able to share with you today an update on our Laundry Room. This room has been a work in progress for WAY too long. I shared with you in January mid way through our progress and asked for your advice. Thanks for everyone who shared. I did read each and everyone and even got a couple of emails with some great advice that actually helped push me in the right direction…so thank you. I have the best readers! We built the washer and dryer platform in January early this year. We started the actual remodeling process on this room way back before Thanksgiving when we painted our lockers white. I was really worried about painting ALL the cabinets white in this room, so I was struggling with trying to decide where to go next but knew that I was not happy with the final overall look of the room. Then, we got crazy busy with the remodel of our kitchen and getting our wood flooring installed during December, January and February. So this room just sat in limbo…waiting patiently (ha!) for its turn. Well, I got the perfect burst of energy to finally get this room ship shape during April after Snap of course! As you know, I am one of Lowe’s Creative Bloggers and our challenge for this month was to give a room a new facelift. Just the motivation I needed to finally tackle this room once and for all. And I am really happy with the final outcome. There are still a few things to get just right…like the items on the shelves and the right window treatment…but overall I am loving it. I am so glad we were brave enough to paint the cabinets all white. The room is so bright and fresh now! Here are some other earlier updates we have made to this room if you are interested in checking them out as well. Well, that is not all…One lucky Idea Room Reader is going to win a $100 Gift Card to Lowe’s as part of Lowe’s Makeover Challenge. To enter: Simply leave me a comment on this post and if you have a room you would like to make over, I would love to know which room and why. That’s it! One comment per person please. *Giveaway is open to US residents age 18 and over only and closes Friday, May 4 at noon MST. Winner will be chosen at random and has 24 hours to respond or a new winner will be chosen! **I was given a gift card by Lowe’s to create my Lowe’s Makeover Challenge this month. However all opinions and statements are my own. I would like to makeover my kitchen! I would LOVE to make over my kids rooms. I would love to makeover pretty much every room, but I need to start with the kitchen! Great makeover! Looks wonderful! If I could makeover one room (first before any others) it would have to be my kitchen. I have pink countertops, yes, pink countertops. I have a dropped ceiling and it is desperately stuck in the 80’s. Not in a great music, neon leggings, big hair 80’s but in the oh my gosh I have pink countertop 80’s. We are beginning to make plans to start to renovate and the kitchen is number one on my list! I would love to update our living room in our duplex (we are moving back in this month after being house-less since September). :) Great laundry room! Oh my kitchen..last of 2 rooms to renovate..it is just awful..it is just such a big job and there have been so many things to redo that it and the laundry have had to wait their turns! I would love to makeover my master bedroom, it is the one room in the house that always comes last and I don’t want it to be that way anymore!! I would love to make over our guestroom! I started it a few months ago, but haven’t been able to finish it yet! I would like to update my backyard, it desperately needs help with weeds popping out of every corner. I would love to makeover our bedroom! We finally own a home after living in military housing for years. After living here for a year we have only painted one room, my daughter’s (the smallest) lol. Love your laundry room! i would love to make over my kids bathroom by tiling the floors, painting the walls, adding molding and replacing towel racks with hanging hooks so that my kids can hang up their own towels! I would love to have some extra funds to make over our spare bedroom into my craft room! I currently sew in our breakfast nook, have my cutting table in the living room, and have bins of fabric ALL OVER my house. And I sew almost every day, so nothing ever really gets completly put away :) Thanks for the chance! Your laundry room is beautiful! (not an entry, but had to comment ;) ) This is FABULOUS! It looks so crisp & clean in there! I have to say I am SUPER jealous of all the space you have in there! Our laundry room is just big enough to hold ONLY our washer & dryer, so it’s a super bummer! So, I’m in love with yours! I would love to makeover my room. I live in the attic and I would like to add a closet to my room. I am currently working on organizing my garage (does that count as a room?) I would love to get a system to hang tools and sports equipment on the walls. Wow!! Your makeover looks AMAZING!! I can only dream of a laundry room that fantastic :) We have several rooms in our house that could use a face lift & some that need a total rehaul…The top of the list right now though is probably the nursery. It’s currently being used for storage (or as a great room with an air mattress) but I’m sure our 3w old would eventually like to sleep in his fancy crib & not a pack’n’play lol! i actually would be giiving it to my mom to finishing repairing the bathroom or replace all the missing tile the was ripped up when an inspector was looking at her foundation. since she has been out of work for two years and my dad is being laid off it would feel great to help them out. I have my sons bedroom to make over and I would like to make his Star Wars bed ourselves. Wow, your laundry room looks beautiful! I would love to finally fix up my basement living room – ripped out the pink carpet and wood paneling about 3 years ago and it could use some TLC. Love your Bright White Laundry room. I will be doing a makeover in my kitchen and plan on painting the cupboards white. I want it to be bright like that. I will be putting gioni granite on the countertops, taking out some cupboards and putting up shelves and adding a new backsplash. I have alot of ideas, now I have to find time and money. I would love to redo my master bath. It is old school 1980’s! The laundry room looks beautiful, I wish that mine was that big to have that much storage. The room I’d most like to make over would be my living room. It is rather a strange layout. Huge bay window takes up one wall, stove style/fire place and brick wall takes up another, hallway wall is another and the final wall has an opening and a few steps down to den! You tell me where I should put furniture LOL ’cause I have one chair in there :) so any help would be greatly appreciated. I would love to help out my powder room, it hideous right now! Would just love to have a home to update! I would like to make over our bathroom. It’s stuck in a different decade – – lots of brass, mauve/green/cream flooring, and a tinted shower door. Gah. We are currently making over a play room into a nursery, so we have been living at lowes! Our next room is our kitchen. I dislike the floors and hate the cabinets so very much. I’d love to redo our sunroom….it’s just a total mishmash of stuff right now. My poor laundry room doubles as my craft area. It’s screaming for the makeover that I have in planned my head, but I can’t stop crafting (or doing laundry) long enough to do it! I would love to make over my bathroom. I need new counter top! Your laundry room looks great! My bedroom……….the last place I seem to get to. Our master bath is in need of a change. I’d like to install bead board wall paper & get new rugs, etc. Thanks for the give a way!! My laundry room also needs a makeover – after seeing your, I know how sad looking mine is! I would love to update our dining room. We haven’t done anything to it since we moved in besides get a new dining room table. The paint colors are hideous maroon and tan. 2 projects are on the forefront: getting new matching blinds for windows in the front of the house, and to put down new flooring in our master bathroom. I’d love to make over our master bath, but what I want to do would involve moving walls. Looks good. I would love to finish the kitchen. I started by reorganizing inside the cabinets and adding new containers. But now I need to switch the positioning of the oven and dishwasher. A major task but my dishwasher is across the room from my sink. Who does that? We are moving to a new house that needs a total makeover. It’s a great house with super high ceilings and awesome woodwork but EVERY room needs repainted! And I’m in the process of repainting all of our dining room furniture to match. whew! I’m tired and we haven’t even moved yet! I need to remodel my master bedroom! I have been so busy doing every other room in the house that now our room has become seriously neglected! My living room–it’s so non-functional right now and its best features are hidden. I would love to finish my craft space. It has been a work in progress for a long time and I think it is about time to put finishing touches!! I would have to makeover my patio area. There is no seating out there except for the kiddie picnic table lol! I would love to remake our entryway. It is so small and once you get coats and shoes for 3 kids and 2 adults there is even less room! I’ve already pinned my ideas and would love to get the gift card to make it happen! OUR KITCHEN! No question….we need to redo our kitchen. Time to rip out those nasty peel-and-stick tiles and give the rest of the room a face lift. My office is in deperate need….. It seems to be the catchall room at the moment. I would love to makeover my kitchen. It hasn’t been touched since the 1980s. Hello spare bedroom! We have a steady stream of overnight guests in our home. Right now they get to rest their heads on an air mattress because our spare bedroom is serving as a toy room. I would love to be able to give our guests a quiet space where they could sleep past 6:30 in the morning without two toddlers in their face. Thanks for the giveaway!! Our house is new so there’s not too much I’d do. I’d love to be able to finish our basement so my husband has an organized work space. Our laundy room could use a facelift too. It’s just boring and doesn’t have a window so it’s dark. Definitely my entryway and living room. When we moved in EVERY wall in the house was painted “builders beige” and now there is”hand drawn art” on three of the walls that not even Mr. Clean’s magic eraser can get off! I’m in desperate need of a master closet make-over. From paint to some closet organizers would do the trick! I would love to makeover our office/ craft room. It’s just a table and shelf! Love it! I’m in the same position. We turned an old kitchen into a laundry room about a year ago (I’m so bad at deciding on finishing touches). We also have our washer/dryer on a platform, same white cabinets also. I’ve got window treatments up but no decorations on the walls! I just don’t know what to out up but this gives me some inspiration! Thanks! I would really like to make over my bedroom. Our house was built in the 70s and we have the uggliest blue carpet you have ever seen. And with it being light blue…you can imagine what it looks like. I need to rip that stuff up, and lay some nice wood flooring. Thanks for the giveaway! I would LOVE to be able to makeover our kitchen! it has such old, cheap, beatup cabinets and the setup is not ideal! would love to add in a breakfast bar too! I would love to make over my bedroom. I am moving to a house that is litterally 1/2 the size of the one I’m in now, so I need to build a new sewing area that will accomodate my 3 machines and mounds of fabric, but fits well into the space we have. I would love to makeover my kitchen. I would like to be able to use the small space I have more efficently. Hi Amy! The room that I would love to re-do is the bedroom. We need color so badly in it and storage space for clothes! Our bedroom is our retreat at the end of the day and it would be so nice to have something beautiful to end up in at the end of busy days! I hope we win! Thanks! I would love to make over my laundry room. My house was built in 1962 and storage is nonexistent . It is very dark and depressing, your laundry room is absolutely beautiful! would love to update my craft room! it always seems to be the last room picked for makeover projects because no one sees it but me! I would lvoe to update the ceiling fans in my boys rooms. Neither works. We live in south Texas. They are a MUST! 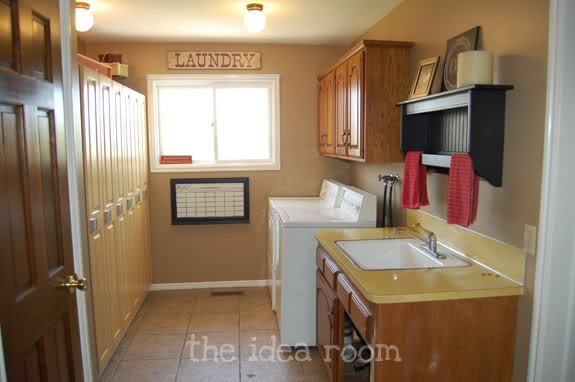 I would love to makeover my laundry room. Our house was built in 1973 & it needs an update! 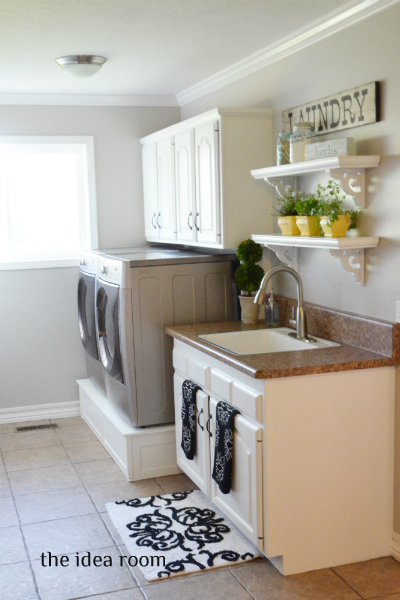 Your laundry room makeover is very inspiring! I have been seeing a lot of pretty laundry rooms lately and mine is so very ugly with peeling paint and 40 yr old flooring, so I would definitely like to redo it! Definitely our mud room. It is also our laundry room, coat closet, and kids dump area. It needs to be organized and have a place for everything. I love how yours turned out! Well, every room in my house needs work but options are limited since we rent. What I really REALLY need is grass – in my yard – to replace the weeds that currently cover it! I would absolutely use this GC to give my kids a better yard to play in! I am dying to do our master bedroom. The kids rooms have both been done twice. Ours hasn’t been touched. I would soooooooooo love to makeover my laundry room, too. Yours is beautiful. Mine is probably half that size, if that. I don’t even have cupboards, just a shelf! I cringe every time my washer makes this weird squeaking noise, too! my master bath is in rough shape – outdated paint, missing toilet lid, etc. Because no one besides our family uses it, it is always on the bottom of the list. And someday, I hope to HAVE a laundry room! ;) yours looks fantastic! Very nice update. I love how the idea of how clean and fresh enters my mind with the accent of the yellow (lemon) color and green from the plants. The space looks fresh and airy. We finished our basement and our entryway from the garage needs some help! We would use this gift card towards fixing it up! It would be great, thanks! Everything needs a ‘refresh’ in my house….but I would start with the sitting room as I hate the color of paint in that room and the closet doors need to be replaced….and I’d like to put in hardwood. Holy cow I am soooo jealous of your laundry room! My current redo project is our master bedroom. It is in such sad shape!!! The laundry room looks so nice. I love the lighter color and the painted cabinets. The crown molding makes it all come together. Great job. I would love to get this much storage and style in my own laundry room. It still has the flat paint and built-in wire shelves, so it is a miserable space to be in…I would LOVE to re-do the entire room! I’d like to make over our avocado green 70’s era bathroom complete with gold fixtures and green shag carpet. Phew! We are currently in the process of buying a house and should be moving into it within the next month or so. The house needs some work and the first room I want to redo is the kitchen since it is truly the heart of the home. I can’t wait to get started on it! Our basement is in dire need of a facelift…and then some :) Thanks for the great giveaway!! Blessings! Wow! Your laundry room is gorgeous! If I won the gift card, I would redo our master bathroom. We never really did much with it, mostly because of money constraints so it would be fun to spruce it up a bit! Great job on your laundry! So inspiring!! Hubster and I moved to Florida in January of this year, after we sold our Texas fixer-upper in 60 days (whew!!). This time around we’re going to tackle a waterfront condo re-do. That gift card should would come in handy when we’re replacing nasty carpet with stunning new tile! I’m hoping for wood-look tile, but Plan B is laying down a gorgeous oversized-subway charcoal grey tile to get a very similar plank look: Clean and chic. Gotta love sweat equity! I would love to make over the dining room. Right now it is an empty room. I’m waiting to have the money to buy the table and jump from there! Definately the master bedroom. The most important room and the most overlooked and neglected room. thanks for the giveaway! As much as I would love to remodel my laundry room and master bath I would have to say my kitchen. It’s really not that bad, but my reason is that my husband has Multiple Sclerosis and has moved into a wheelchair about a year ago. He can’t access anything in the kitchen any longer. I would love to reconfigure to create a handicap accessible section that he could use. Plus our refrigerator is falling apart so I need a new one and my daughter ruined our counter top with nailpolish remover – the kitchen is ready for a facelift! I would love to remodel our sunroom. It has so much potential! Love the cat door idea–may have to steal it! Would love to makeover my bedroom! I would love to makeover our small hallway bathroom! We need new paint, new faucet, sink, and light fixture and it would be just darling :) I hope I win! I really love your room. It reminds me of mine at home!! Our laundry room is almost done too! I will not start another room until it is complete. I am definitely taking inspiration from your room to make it feel fresh and bright! My Boys’ room is the room that really needs something done the most! I would Love to redo/organize my laundry room or loft area!! That gift card could help me get started((: Thanks for the offer!! I would love to change the flooring in my kitchen & family room to match!! I would love to remodel our entryway – we need organization! Your laundry room is beautiful. The next room in our house to redo is our guest bedroom, I want to change out the ceiling fan and light fixture, blinds and repaint. If I won I would change out some ugly light fixtures in my kitchen and a new ceiling fan in my bedroom. Can’t sleep without the thing and it just started sounding like it was going to fly away on us. I want to redo our laundry room, too!!! I love your pedestal!!! Oh how I need this! My master bedroom would love some lowes love! My laundry room is in need of some TLC! I love your closet storage on the one side of the room! Your laundry room makeover looks amazing. I would tackle our kitchen as we have been intending to finish our remodel for a long time. What color are your walls? I love it! I really like the colors you have in your new laundry room; very peaceful. I’m in need of a laundry room makeover myself. My challange is a door that opens up almost right to where my dryer is, so I’m gonna have to comform with just shelves instead of cabinets. The plants look lovely,by the way, great idea! I found you when reading Ana White’s site. Your rooms look great, makes me want to start right now, but I must wait until summer years is here. I have been wanting to finish my laundry room and you have some good ideas. thanks for posting the pictures. My laundry room!!! It is the room we come through from the garage and it needs a facelift!!! I have an office that has been in limbo needing to be completed! I would like to makeover every single room in my house! The kid’s bathroom, my goodness that room needs some TLC! I would love to make over the main bathroom in the hallway. Thank you for the giveaway! I would love to makeover our living room. It need some help. I would love to be able to update my toddler’s room! 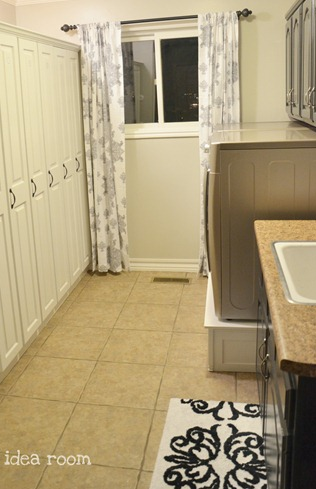 The room looks fresh and clean…..just like a laundry room should! We are military so I miss having my own home that I can paint and change as I please. The upside is that my husband is an officer, so we do have the luxury of renting very nice homes. However, I am constantly challenged to find temporary ways to decorate and customize things to make it feel like our home. Introducing color used to be my biggest challenge, but I am a pro now! Lowes and I are GREAT friends! I spend SO much money there, but at least they are kind enough to honor a 10% military discount! Thanks for the blog updates! The list is a long one– laundry room, pantry, bedrooms, basement…I could makeover just about anything in the house. Thanks for the giveaway! I am also in the 1/2 way mark of making over my laundry/mudroom, I don’t have the HE washers like you, but I think I still want hubby to make the pedestal underneath, less bending over!!! I like how bright your room looks, I need to build a shelf unit for my laundry baskets and two other cabinets for all my sewing stuff. Love the print on the curtains too!! Great job! I don’t have a laundry room… it is more like a laundry nook! I really need to maximize the storage in this space since it is so small and compact, so that would be my makeover space. Love your makeover, it is just gorgeous! My living room needs a little love! I’d love to make over our little laundry room/bathroom area. I would love to make over our office! It’s been the dumping ground while we’ve tried to organize the rest of the house, and it is in need of some serious TLC. I love that you painted the cabinets! I would love to makeover my kitchen! ie Painting the cabinets, adding a backsplash, new counters and flooring. I seem to be in a holding pattern with pushing the go button though! Thanks for th inspiration. We started remodeling our kitchen and would love to put the finishing touches on it!! My husband and I are total DIYers. I am a teacher and he is finishing up school so we have to be DIYers out of necessity but we LOVE it too! This summer we will have more time then ever to do some updating to our home. We have a lot of wishes for our home and just need the money to do all the ideas we have floating. So a gift card to Lowes would be awesome! OK–just thought you should know that I will be moving in next week AND will be doing all your laundry–bring it on! What a beautiful remake–very inspiring! We just enclosed our patio and I would love to spruce it up with some fresh paint and ‘outdoorsy’ stuff. Thanks for the giveaway. I don’t have a single room that needs a remodel (well ok – all of them need it! ), but what I’m dreaming about is new window treatments – especially for my boys room!! Thanks for the giveaway! My whole house needs to redone so I would love to win this. My living room needs an update. It really needs a punch of color. At the moment it would have to be our fireplace and mantle. Ick! Awesome giveaway! I’ve been wanting to makeover our bedroom and this would give me a nice kick start! Your laundry room looks awesome! I would love to win the Lowe’s giveaway. I have been wanting to re-do my bathroom for awhile now. My shower is in a sad state. I would love to work on my laundry room. We are wanting to add some lockers and new cabinets. Thanks for the giveaway! I want to redo my livingroom. All it is, is white walls, a couch and loveseat, and an old entertainment center. I need help! Beautifil laundry room. I am jealous my laundry is so small, but at least it is not in the garage like alot of Florida homes have. I would love to do up my daughter’s room. It is a scary place for her when it is dark. I would like to make it alot more appealing to sleep in. I would like to make over my patio! I have never had patio furniture and am dying to have some! We would love spruce up our yard in time for summer with some new plants and shrubs! I’d love to make over my bathroom! Your laundry room looks fabulous! I would love to makeover my bathroom…it needs a lot of help! My kitchen hasn’t been painted since our house was built 12 years ago- the paint is sooo grungy! And the orangey-oak cabinets could definitely use a coat of paint as well. I want to re-do our living room – not completely, but some new artwork and accessories would be fabulous! I would update our guest bathroom! It needs help!! The master bedroom! The previous owners of our home had very interesting taste in paint colors, and since our room is really only seen by us, it’s fallen to last on the to-do list. I would love for the master bedroom to feel like a place to escape, rather than one big project waiting to happen! I love it! I thought the black cabinet looked great but, I love the white even better! You did an awesome job! Looking foward to the details for the shelves. 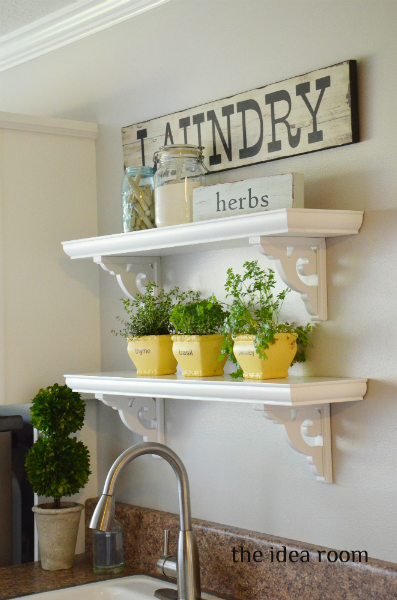 I am wanting to do 2 shelves like that on a wall in my kitchen, and would love to see how!! You’re laundry room is awesome!! We’re currently looking for a new home and I know as soon as we find it, we’ll be making a ton of trips to Lowes. We are really ready to give our kitchen a makeover! The previous owners painted all of the surfaces in the kitchen, including the tile countertop/backsplash, the cabinet hardware, and even the sink! It’s all starting to peel up, and I’m not sure how much longer I can take it… We did recently buy new under-cabinet pot and pan storage from Lowe’s, and it has been a fabulous investment. It feels like we have doubled the storage in our tiny kitchen! I’m getting ready move so I have all sorts of ideas for my new home! I’d love to win and have a little extra money to play around with! My laundry room/guest bedroom! Yes, my washer/dryer is in a closet in our guest bedroom. We have put a long countertop in, but some extra shelves on the walls for storage, and a moving cart or something to hold the laundry baskets would be great! I would use it towards outside seating/grilling or inside floors. I would make over my guest bathroom. It needs some TLC! Oh My Gosh. My whole house needs a makeover! I would for sure start with the dining room. I want to add some crown molding, new paint and something to the walls! It could be spectacular! I’m in the process of redoing our bathroom. It needs help! Love your laundry room Amy! I would love to redo our laundry and our master bedroom! I would love to redo our kitchen/dining room and get rid of the dining room to make a huge kitchen! I love your laundry room. One day I want one bigger than a closet. I would love to makeover my master bathroom. I have lovely blue counters….who chooses blue counters. Thanks! I would work on my laundry/craft room. I need walls. I would love this! Every room in our house needs a little tlc, but I would use it for our master bathroom which needs a lot of love! Love Love Love your laundry room! SUCH an improvement over the before! Love those lockers, they look so incredibly useful. I’m wondering though if you built the shelves over the sink or if you bought them like that, and also where you got the brackets from? I’ve been searching for some just like those!! Thanks in advance! Love the all white cabinets!! Going to try this in my kitchen to freshen it up! now I just need to knock out a wall so I can fit that wall of cabinets! It looks beautiful, and functional! Well, lets see…the list is long, but we could sure use a $100 gift card towards updating our old pink toilets, sinks and Formica walls in our bathrooms. I need our laundry room/ storage room to be redone- it has been in the same style as when we moved into the house and just does not fit our families needs. We need to makeover our small master bath and $100 would be a great start! I would LOVE to makeover our laundry room!! We would start with more storage space for sure, that way maybe we could have more organization and less clutter!! As for me, the next room on my list (and one that’s been in limbo for way too long) is my kids’ bathroom. It definitely needs some TLC. My bedroom needs a new makeover! It is small, but comfortable! Need to lighten it up!!! 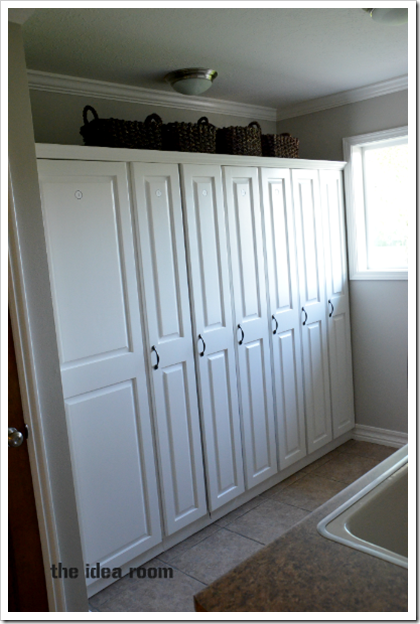 you’ve inspired me and now i want to redo my laundry room….those locker cabinets would be a perfect thing! We need to makeover our bedroom! We live in the city and we have small spaces so our larger bedroom has our storage bins on one wall along with a cheap desk for the computer. I would love to have a new bookshelf, side table, some shelves, and our closet could use a makeover too! ha ha! Working on 4 kiddos rooms, actually a taking a break from painting to type this!! I would love to finally start on my master bedroom! I am jealous of your laundry room and wish I had the space for mine. If I could make over any room in my house it would be my master bath. I would love to put in a tile shower with a bench and a glass door. It is a pretty standard bathroom and I would like to add some charm. I would like to makeover not necessarily a room, but our yard. It needs a few little touches to really bring it back to life and the gift card would go a long way! Definitely my bedroom! I absolutely love your laundry room! I’d love to make over our living room. We also have a really scary basement laundry room that needs much more than a “make over”! I want to redo my kitchen. It is soo outdated. $100 is a great start. I would love to makeover my main bathroom. It needs more storage areas and some architectural interest like bead board and crown molding on the walls! I would love it to make over my sewing room. It’s a sewing/play room/exercise room. It has a lot of functions and it shows. It would be so nice to have a little extra money to make it a room we love to be in. We recently bough a fix-er-upper house and we have plenty of things to work on. We still need to do base boards, paint the door frames, paint the exterior of the house, make a path outside, put up a fence…whew! We have a lot to do, a gift card sure would help! I would love to win this giftcard!! We just bought our first house and have 2 little boys and I am really wanting to make their rooms perfect!! I have just started planning for a covered patio make over! This would be oh so helpful! I have too many projects to choose from, but top on my list right now are new flooring and remodeling our kitchen. Hi! After 8 years and 7 moves, we have finally purchased a house that will be our “forever home”. It needs work, but we couldn’t be happier! The first room I’d like to tackle is the kitchen – it is in desperate need of an update and new appliances. We love Lowe’s and a gift card would help us make our house a home. Thanks for offering this great giveaway! I would love to makeover my main bathroom! I have a spare bedroom that has been vacated my children that have spread their wings and now I would like to turn it into some sort of craft room with a different “centers” for my hobbies, sewing, crafting, scrapbook, dIY, etc. Thanks for the opportunity! I would finish my laundry room. It needs paint, trim, and a few doors for some cabinets. That would make me happy! Since we are trying to buy a house we will soon have all of our rooms needing a facelift! My front porch.. is that a room? it needs a little lift. I love your laundry mud room! Awesome. 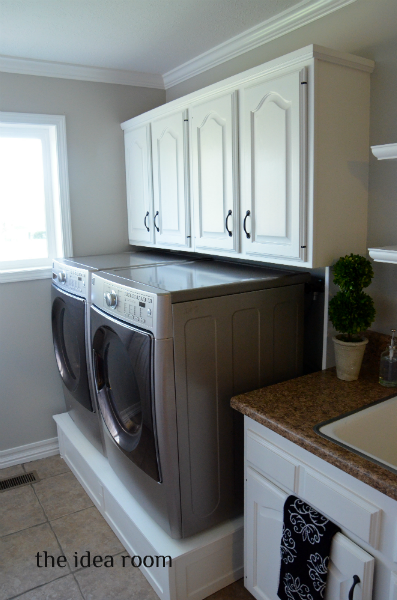 I would love to redo my laundry room, because their are no cabinets for storage! I love your colors! I’m in the process of a basement laundry room/bathroom re-do right now. A Lowes gift card would be ever so helpful! our kitchen needs a makeover! because last time i checked mustard yellow formica countertops and backsplash were not in style. oh, and they tilt…. beautiful makeover! my kitchen needs help! Really have enjoyed your makeover of the laundry room! We need to redo our kitchen…the flooring is 30 yrs old! I would redo my laundry room. It is huge and offers tons of storage, however the space is just not being utilized to it’s full potential! I would use it for my kitchen. It needs some TLC. I would love to have a laundry room as beautiful as yours but, alas, ours is the end of our galley kitchen,not a real room. Anyway, I am in the process of making over our master closet and could really use a shelving kit from Lowe’s. Thanks for the chance to win! I would love to win! We just had our garage painted and are in desperate need of some shelving/hooks/etc in there! I would love to makeover my main floor spare bedroom, AKA my dogs bedroom! It has a nice big window, but I do want to make it welcoming for guests. I’d love to make over our bedroom! It needs a paint lift badly! Our basement…it definitely needs to be repainted and reorganized. I love what you have done with your laundry area!!! Such a clean look! If i won the $100 gift card, I would make over our family room….It is down stairs in our basement. It’s a big room that needs some fresh paint and new curtains to brighten the area. There is a sink area where we have a craft table for our kids that needs new flooring. Your laundry room looks AMAZING! I have started some projects in my kitchen that I would LOVE to finish. Just waiting for the $$. We’ve lived in our new house for about six months, but there are still tons of things to get finished. My daughter still doesn’t have blinds in her room! I find myself at lowes at least once a week! We’re going to be moving this summer so I’ll need to decorate a new house! Currently we are struggling with our master bedroom. We can’t decide on colors, we need storage options, and we are going crazy in our growing, mismatched, unorganized mess! Oh man. We just bought a house that needs every single room made over. I’m starting with the entry way and formal living room. Wish me luck! We are wanting to update the kitchen, the house is 35 years old and the only things that aren’t original in it are the fridge and dishwasher. It is definitely time to update the old green stove. I’m in the middle of working on my bathroom. Taking them from builder basic to us. I would love to do some remodeling on my guest bathroom. It is still in it’s builders decor! I have lots of rooms that I could use it in, but I would probably use it for the outside. I want to completely redo my front yard. My master bedroom desperately needs help! I’ve done nothing but put a bed in it 2 years ago! I Our home is 14 years now. It all seems like it needs to have some redos. Iwould start in the kitchen. Want darker floors. Then I wouldnt have to sween 2 times a day. I would love to redo my kitchen. It needs an update really bad. New counters would be first on my list! Our backyard needs some TLC! Oh I would love to win this. My upstairs hall/family room needs some major love and a colour that is not hospital green. If I won, I would actually do some finishing touches in my living room. I have been wanting to build a bench for a while now…this would be the perfect motivation. So hard to choose just one room! I’ll have to go with the kitchen – thanks for the chance! My daughters’ room needs a good facelift. They have beige mostly bare walls. Walking into their room you wouldn’t know it belonged to two cute little girls! Just moved – I would pick finishing the kitchen first! Thanks! We just bought our first house! It’s great, minus the 1970s decor. Really want to fix up the kitchen, it needs to be BRIGHTER to match our family! We want to make our spare room into a school room! $100 to lowes would be awesome! Oh our Bathroom! We need a new vanity and new flooring! It’s our summer project. A little paint wouldn’t hurt either. I have finally figured out my “style” and so this bathroom project will be so much fun! Fingers crossed on the giveaway! I love your ‘new’ laundry room. I’d love to red o our laundry space or our mudroom. Both need storage in a bad way! Our laundry is in our garage (LAME!) and I want to make it feel more laundry room-y. I would like to update my livingroom dining room area. If you actually seen it you would know why..lol!! it needs color, light fixture needs updated and more.. please help!!!!!!! You always inspire me and give me fabulous ideas..I would love to make over 1/2 of our garage..As a “junker” and vintage clothing dealer I would love to have a space to set up my works in progress that functions..rather than always grabbing a corner somewhere here and there and be able to leave it out while I am working on it…a space of my own and we have it in the garage..I just need a way to help it become my own! It looks gorgeous! Do you mind sharing the paint colors for the wall & the moldings? We are remodeling & people are trying to talk me into molding colors that are too yellow for my taste & yours look great! Our master bedroom has been horribly neglected since we moved in (8 1/2 years ago – ouch!). It desperately needs some attention. It’s that space that no one sees, but us, so we just haven’t gotten around to it. thanks for the giveaway! – your laundry space looks awesome! We will be tackling the mudroom/laundry room soon. Right now there is a bathroom and very small laundry area. We’d like to remove the bathroom to make a large laundry room, complete with lockers. Love your makeover! I would love to makeover our master bathroom!! It REALLY needs it! I would LOVE to win a gift card to give a little makeover to my home office! It’s in desperate need of a renovation! I would love that gift card to help us make-over our kitchen. I hate it! Thanks for the chance! I would love to finish my daughters playroom. I have so many great ideas for displaying her art and storing her “stuff” that i don’t know where to get started again. We began this project last summer and I hit a creative road block. Im reay to take it on again, just in time to get her organized for kindergarten this fall. I love your site and all the ideas you share. This new laundry room makeover is great. I would love to know where you got your curtains and rug. I just painted my bathroom a similar color and have been looking for the black and white/cream accessories. If I could redo a room in my house it would be my kitchen. My two sons and I love baking and doing crafts. The kitchen is where we spend a lot of our time. My husband is constantly reglueing my countertops with gorilla glue b/c they are coming apart. I wish I had a more up to date kitchen that would be kid friendly for the boys. Thank you for sharing all your great ideas. Please keep them coming. Our kitchen needs help! Old 80’s cabinets and gross drop ceiling! We would love to win! I love your laundry room – Laundry used to be my favorite thing to do till my laundry room became a catch-all. You have given me inspitation to clean it out and update it – thank you – I’m bookmarking your post and will refer to it often!! I would love to redo our family room! I’ve never liked how it looks. I would love to makeover my daughter’s room. She just turned 11 and is dying for a “tween” room! Oh my I am in love with your laundry room. We bought a new house about a year ago and loved that the laundry room was enclosed in its own room, but looking at your laundry room makeover I now feel like what I called our “cool enclosed laundry room” is nothing more than a large walk-in closer. Wishing we had a bigger area that’s not enclosed and could make it as beautiful as yours. We have several rooms we are wanting redo, but we would probably start with my oldest daughter’s bedroom. She has been begging for years and we are hoping to start it in the next month or so. I would LOVE to makeover my master bathroom. We are in the process of trying to decide what we want but the hubs already tore everything out it’s a mess and this would be perfect!! Our laundry room. It’s the only room we haven’t touched since we moved in. And I’m also a little afraid our washer and dryer (which are ancient!) might not make it too much longer!! What a fantastic job you have done with this room! It is absolutely gorgeous! I totally have a little bathroom that has little pink bunnies and pink paint that really needs to go. I could probably do it with the $100 and the few supplies I already have. I want to makeover my sunroom. Very odd shape and I need ideas and $$ for it. Thanks so much and please pick me! 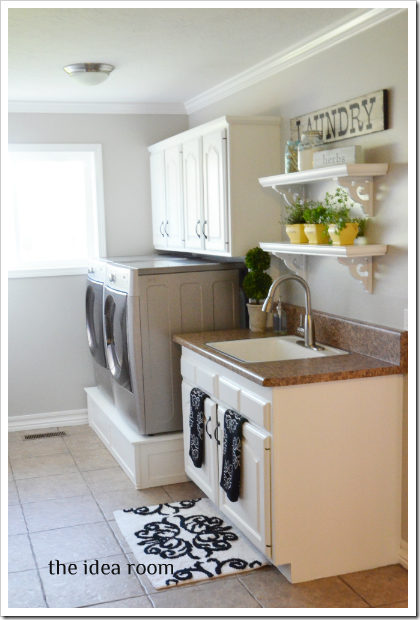 Ohhh, how I LOVE your laundry room makeover!! It’s so fresh and cheery looking… you must love doing laundry now, right?!?! Or at least pulling up a chair and hiding in there every now and then :) If I won the gift card I’d run to Lowe’s as fast as possible for white paint for our oak kitchen cabinets… UGH!!!! Your laundry room is FANTASTIC! I too would like to make over our laundry room. Ours is a laundry room but is pretty much a square box. With a household of 9, we like to stock up on laundry supplies, but we don’t have much space to store everything. I’d love to add shelving and storage solutions that take advantage of the higher ceilings. Only one room to remodel? I would love to jackhammer the terrazzo tile out of my foyer/ fireplace surround but I hesitate because of the tremendous amount of dust it would create in the house. I am glad that you went with the all white look. I think it gives the room a great clean feeling. I am in the middle of trying to update my kitchen. We are refinishing the cabinets and need to update the floor and countertop as well. After that, we are off to moving my two boys into what is currently their play room as we turn their room into a nursery for a baby girl. We are excited for this new addition coming in July, first GIRL! I would love to my laundry/utility room. I need to make shelves for the stuff we get and hopefully to make things better in that room. Thanks for the chance to enter. Man would I LOVE to makeover my kitchen! I would love the opportunity. I would love to make over my half bath. It needs accessories and paint, maybe some tile. Wow! This is amazing!!! What a huge laundry area you have, and it turned out gorgeous!!! Good work!! We would make over our Master bathroom. We have an old house (1965) and that bathroom is in DESPERATE need of some help!!! We have lived here almost 7 years, and I have dreamed of having that bathroom re-done!! I would love to finish our basement. We just moved into our house last May, so there is nothing to be redone. I would love to finish a playroom, family room, and office for my poor husband! I am in LOVE with your laundry room!!! Mine is so small and crowded….but it is better than what I had before so I will not complain :) I would like to do a room for my 16 year old daughter in our unfinished basement so she can have some space away from her little brothers. I would LOVE to remodel our living room- it’s ancient, with awful paneling & cracked plaster ceilings. I need a team to come in & redo the whole thing! I would make over the master bedroom. Plenty of other rooms need our help, but that space could be the biggest transformation. Love the laundry room makeover. I would love to have a makeover in my bathroom!! Your laundry room looks amazing. Such inspiration! I would love to change the flooring in my living room. The berber has got to go! What a gorgeous laundry room! Love it! I would love to makeover my loft and have actual stations for me and the kids instead of everything getting clumped together! Thanks for the giveaway! I love the hidden cat door. Would love to purchase a few things to organize my craft room. Thank you for the giveaway! My basement causes me all kinds of grief; I would love to make it over! Our little 1200 sq ft house has just one bathroom. Having a livable basement would add immeasurable value to our family! How nice to have a space for those half-finished projects that I haven’t quite been able to get to just yet. How nice to have a second room for tv in case the girls want to have a Gilmore Girls marathon while the boys are glued to the Stanley Cup playoffs. And wouldn’t it be great to have organized storage tucked away down in the basement, especially since we don’t have a garage? A comfy, cozy basement would be a huge improvement over our dark, cold, cave. it looks amazing! what did you do to update the little counter top area? did you just replace it? we are right in the middle of a kitchen remodel, so the gift card would be so nice to win! thanks! I would love to redo my Master Bedroom. I want to make it a relaxing sanctuary away from all the kids and craziness! This would be a great help. Thanks for a fun giveaway! LOVE IT!!! I would like to update my kitchen and a gift card to Lowe’s would jump start the project! I ADORE your laundry room! I love all the storage! Awesome job! A room that I would love to red0 is the master bedroom. I would use the gift card to run out and buy paint!!! Thanks so much for the giveaway Lowes and Idea Room! Our dining room! I just recently became a stay at home Mama so money is tight, we bought a foreclosure 2 months ago and the dinning room is gross. Would love to have a nice room to enjoy family meals! Our living room currently does not have an identity. It’s part living room, part kids play area, part tv room. We’re slowly gathering our ideas on how to make it a true play room and have purchased a few paint samples and stuck them on the wall, but haven’t made a final decision. This Lowe’s gift card would encourage us to choose a paint and finish our daughter’s playroom….and finally give the living room it’s identity. I love the laundry room! So clean and fresh looking. Just seeing the pics makes me want to come do laundry at your house! As for my own make-over needs. The better question is which room don’t I want to make-over? I live in a church parsonage that has not had much done other than painting since 1968! The bathrooms and kitchen are my two biggest headaches though. I need help! Looks great! I would love to fix up my office/craftroom. I’d love to update our home office/recording space! My husband and I both work from home – I’m a writer and my husband is a musician – and we just need help making more sense of our space! I would love to redo my master bedroom. I have red and gold paint on the walls and it just isn’t the relaxing retreat I want it to be. Definitely our family room. Thank you for the opportunity! This would be an awesome giveaway to win. We are renting at the moment, but if I could makeover a room in this house it would be the kitchen. Great giveaway! I moved into a new apartment and all of our rooms are still half empty! I would particularly LOVE this for our dining room, which is just a table and walls. I would love to update the storage throughout the house! The kitchen could use it the most! I’d love to do some updates to my bedroom! I think the room looks so bright. I love the details on the rug and towels. They are just the right touch. I’ve wanted to open the wall or create an arch in the wall that separates my dining room from my front room. Then when we have family parties we can all eat in the same area and not in separate rooms. I gave a large extended family! Thank you for including the links to your previous posts regarding some of the project pieces (i.e. the cat door and the washer/dryer platform). What a lovely room with all the white! I would love to update our 3/4 bath. The shower stall is sooooo dark and creepy! I would love to turn my 3rd bedroom into a crafting room and I too need a clever way to hide the litter box! I’d love to win.. I have a few rooms i’d like to make over but most of them i just want to repaint not really remodel.. I would however love to have my back deck replaced.. its older (we’ve only had our new house for a little under 10 months) i think its possibly as old as the house (’89) anyway The covered part is good but the rest is starting to maybe rot a little.. its definitely rough and the paint is halfway gone.. and I’d like to be able to go out there and have a patio set etc.. so thats probably what I would fix if i won. I love your laundry room! I’m using for inspiration for a friend’s new house. As for my place, my bathroom is in desperate need of some love. All the tile really needs to be replaced and it needs some new paint. I need to do some painting so this would come in handy for me. I’ve almost worked my way through my entire house, but next up is the laundry room. It’s small and doesn’t need much, but I plan to paint and accessorize. I would really like to replace our floor in the bathroom. It is a tiny room so it wouldn’t take much. Here’s hoping! Our bedroom! We have painted and/or remodeled other rooms in our house and our bedroom is way past due now! I would love to make over our bedroom. It has the been the room that has been overlooked for a long time! 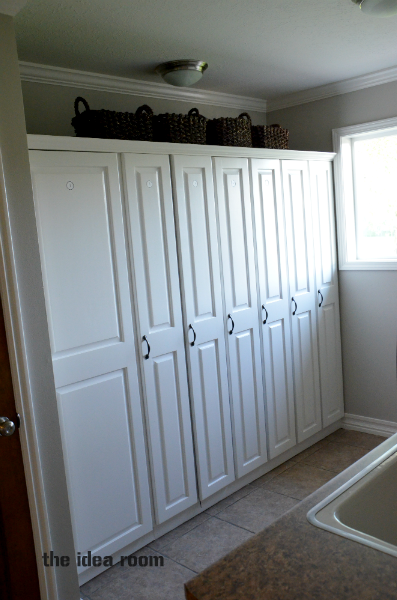 Wonderful job on your laundry/mudroom. Beautiful! We need a makeover of our basement level family room. It is a cave. With exposed duct work. That about sums it up! I NEED to redo our laundry room/pit! I desperately need to paint/redo my living room! Need a living room make-over, because it hasn’t changed much in the 12 years since we married! I would makeover my kitchen! i would love to remodel my bathroom. Its long over due (last remodel was in 1987) It is currently in need of a new color scheme since it is dark green and browns with no window to brighten up the room. It feel so gloomy. I would love to makeover our master bathroom!! I want to do my laundry room. It is so sad and depressing and I don’t know where to start. My laundry room! We are moving into a house without a washer and dryer so it would be a blessing to have some money towards that! We’re moving to a new house in June,so I’m going to have lots of spaces to make over! We plan on moving in the next few months so this would be perfect!! I would love to use it for our bedroom. Wherever we’ve lived, the master bedroom has never gotten the decorating attention that I wanted to give it. A Lowe’s gift card would be perfect for that! I’d love to do a little makeover for my daughter’s bedroom. She’ll be 4 this summer and she deserves something pink and girly! I would love to make over my son’s bedroom. He sister got a ‘pink princess’ room for her 4th birthday and his room is still like it was when we moved in and that was 5 years ago! I would love to makeover the master bedroom. Love, love, love your new laundry room. My kitchen needs a complete overhaul. Everything in it is so old and drab. Would love an updated kitchen! We are currently in the process to buy a 1950 ranch, so everything needs to be redone! But first would be the bathroom. It has carpet! The before and after is gorgeous. You were right, painting the cabinets white makes the room feel bigger and more vibrant. We recently bought the house we’ve been renting so I’d love to redo SO many rooms in my house. Right now the master bed and bath rooms are calling for attention. Oh I have a room….or three! Take your pick: Master bedroom – it’s awful, the playroom, the laundry and a room we refer to as my studio which is actually just the junk room! LOL Keeping my fingers crossed! Thanks & love your makeover! We are slowly making our way through our house redecorating it. We have lived in it for 3 years and we have just 3 rooms left (before I’ll have to start all over again haha). I’d love to put some finishing touches on the laundry room but I’m really focused on my kids playroom and our back patio right now! Love the bright laundry room! So pretty! I have lots of rooms that are on the makeover list, but the next thing I want to do is replace my countertops! I love your laundry room! My house was flooded with 6 ft of river water in June 2011. The house is gutted and sanitized and now we have to redo EVERY room of the house. So sad after we had just completed a 2-yr remodel project. Your room turned out beautifully! I’d like to redo my laundry and kitchen. Pretty much all that is left to be done inside! I LOVE your laundry room! I would like to make over my bedroom. I need something new- whether it be paint on the walls, matching (or mis-matching but tied together) furniture or just new bedding. SOMETHING to make it a little more homey. WOW….that laundry room is amazing! I am so super jealous!! If I won the Lowe’s gift card I would LOVE to revamp my master bathroom. It hasn’t been personalized in the 4 years we’ve been living here (think wallpaper). When we moved in we had to prioritize projects since we bought a foreclosure. So it would be great to makeover that space that fits our personalities more. 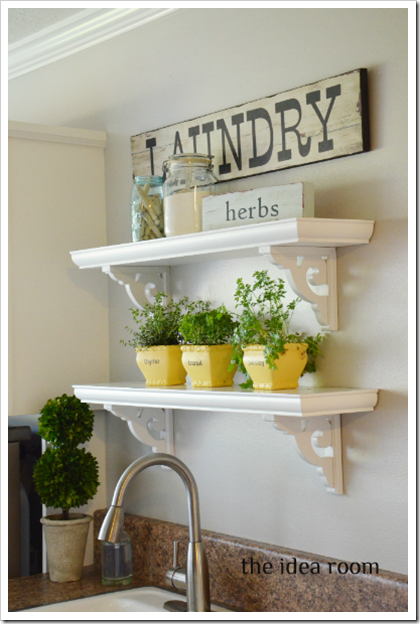 The laundry room project is such a great INSPIRATION!!! We would love to redo the family room but are at a loss for direction. Would love ideas and help. I would love a laundry room makeover. I would LOVE to do my Laundry Room.. it is so sorry looking right now! It is larger than one of the bedrooms in my house, and literally has a washer, dryer, and a ladder laundry rack. That’s all. It’s pathetic, and needs some serious love! I’m pregnant and all the kids are changing rooms. So I’d use it towards some new paint! I would love to redo my kitchen… The cabinets are from the 50s and could really use a face lift! I honestly need to remodel or recreate my front hallway/mud room. At the least it needs repainting, some sort of furniture, something!! I would redo my our kids’ bathroom/guest bath. It could really use a face lift – it has the original 60s white/gold tile and hot pink paint curtesy of the previous owners. It would be so nice to have something updated and pretty for our guests and my kids to use!! I really want to redo my master bedroom. We moved in 16 years ago. It is time. I really want to update the outside of my house. The inside is really cute and the outside, well, let’s just say it’s not cute. $100 at Lowe’s would really help me increase some curb appeal!! I think I’d have to go with my office / craft room. But, Laundry and Pantry are on the list too! We need to makeover our bathroom….it really needs an update badly. I would love to get a kitchen make over. Nothing special. Just a simple kitchen with a backsplash and some new times (right now we have linoleum). We moved in a year ago and tried to to as much as we could ourselves. The kitchen SCARES us both though! My bedroom needs a makeover bad and $100 sure would help!! I would like to redo my master bathroom in the new house we just closed on last week. Missing tiles on the shower and the floor was never put down all the way. wow. When I have a house, can I have your laundry room? I’d give this to my parents to make over their laundry room. Theirs is so ghetto! Cement walls, a string to turn on the light…they need a make over! Wow what a great prize. A room more like a whole house for me. My husband and I bought a house almost 4 years ago. We still have not managed to get in it. It ended up being a complete project. When we had the money we didnt have the time and when we had the time we didnt have the money. We have managed to pull together a few times and get alot of remodeling done. We got so close and then ran out of money again. We were hoping to get in it by this summer but I am not sure that is going to happen. We still need to hang cabinets which we do have thankfully to a friend. But what we still need is counter tops, carpet and flooring and a few more painted rooms. Before we can move in. Yes we need alot but anything would help at this point. Thanks for the chance to get me a lil closer to living in my own home. I would makeover my bathroom. It’s ugly, builder grade cabinets and fixtures. Faucets leak. Desperately needs a makeover! I would LOVE to makeover our bathroom, but there are a few small things that take priority, like replacing the low end dinning room light that has been over our table since this place was built. We are trying to sell our home, so this would really help! I have been dying to redo my laundry room/craft room! It’s needs some serious updating! I would love to makeover my basement family room. It looks like an apartment from my college days with no real design. I definitely want to get to work painting our kitchen! Great makeover! There are lots of rooms in my house that need a makeover, but the one I would love to complete is my master bathroom. The walls and floor are covered in tile and the prior owners of our house were big time smokers, so when the bathroom door is closed for a day or more, it gets really stinky in there. It’s the only place in our house that you can still smell the cigarette smell. Yick. Can’t wait for the day that those tiles get replaced! Our master bathroom. We’ve lived here for 7+ years and have yet to paint the walls in our room. Love your new laundry room!!! I would love to redo mine. It is a small room in the basement. My master bathroom is sad and needs help. It needs new paint, new curtains, a new showerhead and some regrouting on the tile. Thanks for the giveaway! I would LOVE to win a Lowes gift card! I have many unfinished projects that it would be helpful for, but I think the top is finishing my daughters bathroom. An unfinished floor and capped off toilet for the last 2 years is way toooooooo long! :) Love your laundry room! LOVE your laundry room! So jealous of how open it is! And thanks for the giveaway! I actually have a whole 2 story house to makeover! :/ We are so grateful to be moving into a way bigger house, but it definitely needs to be updated and made ours. I would use the giftcard for paint…the living room is really dark and we need to lighten it up. We want to make our kid’s rooms special and fun since it will be the first time they have their own rooms! We have LOTS of projects coming our way! A Lowes gift card would be great for all the projects on the list! I would love to DIY some built ins for the dining room, finish painting and trimming out our hallway, or start working on the master bath! I would love to update my kitchen. It’s SO boring! We are working on a nursery and I’ve been eyeing some new lighting at Lowe’s! Thanks for the giveaway! Ok it’s hard to think in just 1 room, I got a few rooms to do, but I have to choose my bedroom, since we move in , 6 years ago, I had just paint it, I dream with a place to just relax and read a nice book, but my room does not do the trick. My kitchen!!! We moved into a house that had been vacant for 5 years. We did the yard first and that spent us. The kitchen applicances are so old and in need of repair, the cabinets need to be redone, the flooring needs to be updated and it goes into the familyroom (it’s almost like a great room)…..Would love nothing more than to get it done!!! The lower level of our raised ranch! We bought the house under the impression it was dry and usable living space… (think nice fresh paint, a HUGE big screen TV and recliner – man-cave and evidence of a boy’s bedroom) After flooding and ruining a TON of stuff – we discovered we’d been duped. I’m suffering from empty nest syndrome. Trying to turn an empty bedroom into a craftroom. Right now everything is sitting on a 6 foot table. Would be so nice to to have a beautiful craft room with lots of storage space. I love your laundry room! I need to give a makeover to my bathroom! i would love to give either of my kids’ rooms a facelift. I would LOVE to re-do the master bedroom. We just got married in September and we’re still living with my parents while I’m finishing up my Master’s degree to save some money and I would LOVE to re-do the master bedroom for my parents when it comes time for hubby and I to move out. I *really* need to repaint my half bathroom…it’s red and will need a gazillion coats of Kilz to cover that red up! I love your new laundry room….it looks fantastic! We are just starting to refinish our basement, but some (most) of the upstairs needs new paint. Since we are saving for the basement, it would be so nice to have the extra money to paint upstairs. Thanks for sharing. I love the all white cabinets, especially in a laundry. It makes everything feel so clean, and that’s definitely what I would want. Good job! Can I say I would like to make over all my rooms? Really we have a ton of work to do! But I would probably do the master bedroom if I won this! I love your laundry room. I would love to makeover our master bath. Thanks for chance to win. I’m going to say my kitchen. I’ve already started on some of it, but the $100 would help finish it up. I would for sure makeover my kitchen. It is original to the house which was built in the 60s. It’s definitely due! Hi! I love your laundry room! I’m definitely going to be checking out your locker tutorial. I would love to fix up the upstairs of my mothers home. I would either paint the brick wall/fireplace in my downstairs family room (it takes up the ENTIRE wall — the rest of the walls are this cool turquoise color w/ white trim, but the red brick is just so outdated and dark)…. or I would start redoing my downstairs full bath. It’s very tiny, but it has a shower, toilet & small sink. The sink & toilet need to be replaced, the floor needs to be replaced, the wallpaper has to come down (it’s shiny opalescent seashells), and the wood trim needs to be painted (it’s toooooo dark), new light fixture is needed, too. :) Thanks for the chance to win! Love your laundry room! I would like to redo our family room to make it more functional and homey. New couch and chairs, paint walls and replace blinds. Thanks! I would redo our dining room since it’s in the process of being redone but we have so many other things going on in the house right now that it won’t be done for awhile. I am about to makeover our 3rd bedroom for my oldest son who now wants his own room apart from his 2 younger brothers! I love the make over. I would love to redo my kitchen, it was over 25 years ago that I did the last one. My kids room need this! Gorgeous laundry room! We are actually beginning to finish our basement space. It will be my new sewing room and a future guest room. Here goes our first real home improvement project. Thanks for all the great ideas and tips. I would love to make-over my family room. It’s a large room with A-L-O-T of wall space. Our foyer/entryway has bee painted but only as tall as the roller extension can reach… Which means 10 feet of the 15 foot entry is not painted! I would love to redo my family room! We’ve lived in our house for over 2 years now and have never finished the dining room. I’d love to redo it and get it done because everybody sees it when they come to our house. I would use the gc on the bathroom. I do have a question about the bathroom… not sure if you’ll see the question in all these comments though… did you do anything to the sink counter? It looks so different in the before/after pics but you don’t mention it. How awesome if you didn’t! :) It totally changed the look. My daughter is closing on purchasing her first home later this month & I have no doubt she would be able to pick out a room she would love to makeover as it’s a four bedroom, three bathroom home! My son’s room. I’m working on some built-in bookshelves and window seat! Having just moved into a house that has need of some love in every room it’s hard to choose. I would l probably use it to make my oldest daughters room. My husband and I are moving to B.C. from China this summer, so we have lots of projects we will be working on. The biggest will be making a beautiful dinning room table and a diy upholstered bed! LOVE you new room, it’s beautiful! My kitchen needs a good “refreshing…” Turquoise countertops, leftovers from the ’50s! They think I don’t notice, but I see the jealous looks on my friends’ faces when they enter my kitchen! we just moved into our first home and have quite a few rooms that need work!!! KItchen takes top priority! I love your laundry room makeover! It is soooo fresh and simple! I would love to makeover my kitchen because our house is older and so the space is small. Our kitchen is the first room everyone walks into and it would so nice to have it look fresh and simple.also. There isn’t much space so it would basically be the same as what you did in your laundry room, just updating knobs, counter tops, figuring out some type of storage for by the entry door, etc. thank you for the new and fresh ideas, I am going to look for a similar rug and towels. So cute! I want to update my master bedroom so that it is a relaxing/calming place to be. I would love to make over our Master Bedroom! 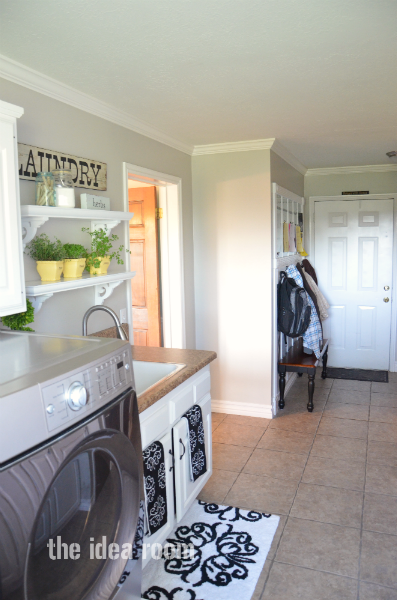 Love how your laundry room turned out…such a fun place to do laundry now! :) I would like to update my master bath and laundry room. I would love to make over my bedroom because it is extremely boring. I also want to do something with my entry way. We purchased our first home last summer. We’ve already painted the kitchen, dining, hall, guest room, bedroom #2, master bathroom, and the office. We’ve also built a deck, garden, and sprinkler system. Now we’re out of “remodel money” :-( … with another $100 we could FINALLY paint our nasty mustard colored master bedroom! Would love to redo my laundry room too! I need new cabinets above the washer/dryer combo and I know Lowe’s would be the place to pick up new ones! Thanks for the chance to win! I would love to re-do my bedroom. It is the one room who’s paint we inherited that just isn’t our style. $100 to Lowe’s would go a long way in converting our PURPLE bedroom walls to something more us. I would love to make over my guest bedroom. It is kermit green right now and needs some new paint and decor! my room. everything in there is cheap and old! The basement/rec room is next on my list. It was damaged during the flooding from Hurricane Irene last year (and home insurance doesn’t cover flooding in this region), so I have lots of work to do. Can’t wait to get started! Wow! 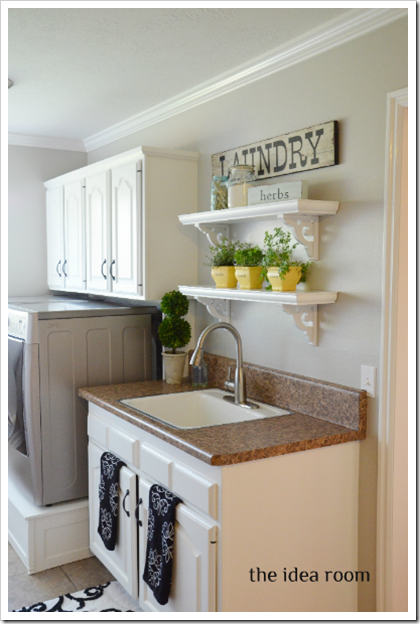 what a great makeover for your laundry room – it is lovely! I envy all of your space – and storage! Our laundry room is tiny and totally needs a makeover – I’ve bookmarked your ideas for inspiration! My kitchen. Update my cabinets and tile!! Ultimately I’d love to redo all of my cabinets in the house. They are a dark cherry kind of color and it is so not my style. But I also really want to buy curtains for my living room and family room. Those rooms need a lift and I think that would be the perfect thing to do! I recently redid my bathroom and laundry room…so the next room up is the kitchen! It’s in desperate need of some TLC! Your laundry room looks amazing BTW! I love how bright and welcoming the laundry room looks! That room is definitely on my list of things to makeover! But, the room I desperately need to work on is the guest room. We have guests visiting regularly and I would love to make them feel comfy and at peace while visiting. Hope to get it underway soon! Wow, that looks incredible! I wish my laundry room look even a quarter bit as good as yours does! Our laundry room is actually in our bathroom and I would LOVE to be able to redo the whole room! It’s a fairly small space so $100 would really go far in there. I would love to update the sink fixtures and put up some shelves for added space to put stuff! Your laundry room is gorgeous!!!! What a transformation! I would love to be able to make over our master bedroom. We just recently bought our house and before that, we lived with family for almost two years. My husband, myself, and our three little kids all shared a bedroom….we were overjoyed when we finally found our house to say the least :) We have put almost all of our effort into make the other rooms like home for our kids, but our room is untouched. We have a queen size mattress set on the floor and a tv tray as a bedside table, haha. We are content just to have our privacy for sure, but it would be awesome to be able to make it a more relaxed and personal place for me and my husband! I would love to be able to better organize my laundry room as well. I don’t have any cubbards and I think with all my soap making and cleaning supplies the laundry room gets cluttered looking with the open wire shelf. I would redo my bedroom. I want it to feel like a sanctuary and right now it doesn’t :( Your house looks great! I am wanting to redo my 3 year old daughters room. It is still decorated as it was when she came home and I would love to change it up to a more young lady’s room. My living room is in need of a makeover! We’ve lived in our house for 7 years and we still don’t have curtains in there! Our master bathroom. We are currently adding this bathroom to our second floor. I love the fresh look of your laundry room. I just love laundry room makeovers because they are sometimes the forgotten room in the house that is the last to get loved :) You did a great job. I would love to remodel our kitchen. We have the original cabinets, tile counters and the room could really use some help! I would love to give either our laundry room or kids bathroom a facelift. Thank you for inspiring me! I would really like to make over my son’s room! Your laundry room looks great! I have laundry envy. I want to make over my bedroom! Nice job on your laundry room! I need something bright to wake up my living room, maybe a great rug. I would LOVE to make over my office. And actually turn it into an office instead of a playroom/catch-all room! I would choose our master bedroom – it’s still as plain and boring as the day we moved in after the house was built. Definitely needs some work, but it’s been towards the bottom of our to do list. It would be nice to make a space that’s much more inviting than its current state. My office is a mish mash of office/toy room with a outdated paint color. Winning this would give me a great excuse for a mini makeover! My boys’ room. It definitely needs a super-hero vibe. Oh how I LOVE LOWE’S!!! I would love, love, LOVE to make over my closet in my master bedroom. It LITERALLY is broken. If hold a few pairs of folded pants and a hamper. That’s IT! What a waste. If I were to win, I would put that gift card towards a closet revamp for sure! Also, love your ideas!! My bathrooms are both in need of a major do-over. Would love some Lowe’s $$! My home office is in desperate need of a makeover…we are currently using it as a storage room / work space, and it is just not working! I need to organize everything and set up a more functional work station than what I have now, which is an old desk that feels like it is going to fall apart every time you touch it. I would love to redo my laundry room also! I have the plans ready to redo the kitchen – so much wasted space! Just need the funds and this would jump start the process for sure! I would love to make over the bathroom, because it is outdated and the tile is cracking. Hope I win! I would makeover my bedroom. It is so boring but it has lots of potential. I would update my kids bathroom. It is the only bathroom we haven’t updated in the house. Our kids’ toy room is in the unfinished basement of our house. That room needs a lot of improvement and I would probably start by adding some light into the toy room. I would like to make over my laundry room also. I am in the process of re-doing my entire basement, which is where my laundry room is. I have already torn down all of the walls but now need to decide how I want to organize my laundry room and create more storage. It is a very daunting task. I want this! I am making a home office. I would love to finish the play room! Needs some primer and paint.. And a few new bins for toys! :) too white for my taste.. It looks great! I’d love a laundry room that size! 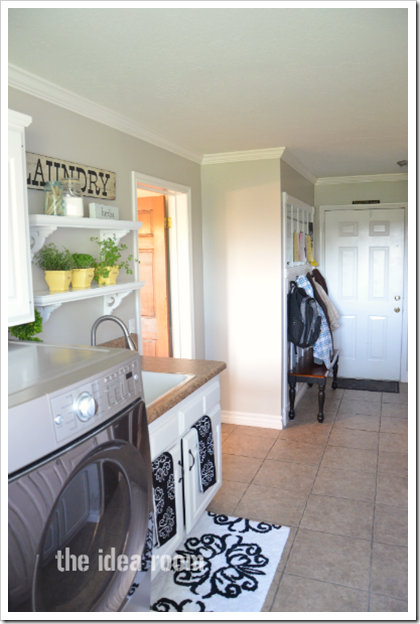 My laundry room needs a makeover too… but the room I would choose first is our living room! It’s RED! And I’m SOOOOO over red after living with it for 6 years (our choice)…. so I’m ready to paint, get/make some curtains and get some new decor! Thanks for the chance! I would do my kids’ room! They’re going to be sharing a room soon and some changes will need to be made! I would love to win this, but I would use it for my outdoor ‘room’. I would love to get an umbrella for our patio set, put in a few trees and other landscaping. My daughter’s room is still the pepto bismal pink that it was when we moved in. I’m sure she would love to have it painted! I would do my bedroom. For a long time now I have wanted to make a head board for my bed. We are moving into a new home next month, so I don’t really need to redo any, but I have a lot to decorate and install. 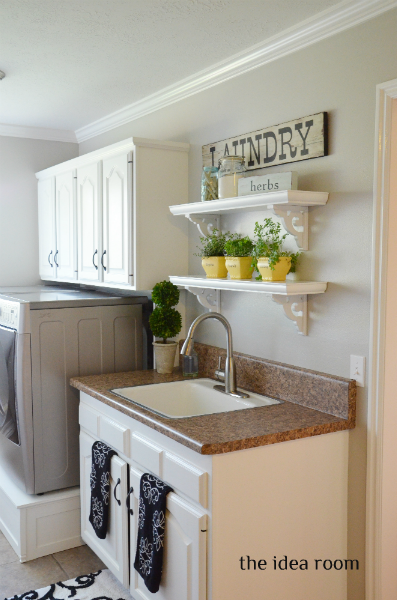 I absolutely love your Laundry room makeover! It reminds me of how much we need to re-do ours. Having said that, the room that DESPERATELY needs done is our 1970’s ish (or whatever decade it is) kitchen. The only thing from this century is the appliances which just our luck are breaking on us and we are only in the house going on 2 years! Anyway, we have hideous dark old style cabinets with retro white knobs. Our linoleum flooring is peeling and shifting since day one. Lets not mention the cabinets that are dropping saw dust every time you open a cabinet door. Oh and did I mention the “falling” sink. Yes, the stainless steal sink is actually sinking on the left side. Ugh! I do hate that kitchen, lol. I can go on and on! We just moved into a fixer upper 6 months ago. I would LOVE to redo our bathroom. The counters are small tile as well as the shower. Ugly plain mirrors as well. I would JUMP for joy if we could knock out the project soon. Your laundry room looks great. I would do my master bath. It might be a while for that. I love looking for new ideas though. With 4 kids I never can get anything done in the area of home improvements. I desperately need a functioning laundry room. It’s essential for a home of 6 people. That’s the first project on my LONG list. I am in love with this! You did such a great job! Love the pops of yellow with the potted plants! I would make-over the master bedroom because it’s boring & the carpet is looking nasty! I was just telling my husband that we needed more shelving/organization in my food storage room. This would be just the motivation to get it purchased and done!! Our bathroom needs some serious updating! I actually would use the giftcard to buy some powertools for the hubby! the kitchen desparately needs some lowe’s help! we have original 1970s cabinets that aren’t even real wood, and counters that have seen better days. i also attempted DIY sand painting a few years back and, well, let’s just say smooth is better. :-) thanks for the chance to win! I love your laundry room – my favorite part are the curtains! I would love to redo my sons’ bedroom. It’s taken a beating over the last five years from two active boys! Fantastic makeover! I have to say, I wish I had a laundry room the size of yours. Mine is about the size of… well, the corner where your washer and dryer are. Really. I’d love to do a bit of a makeover in my family room. The window coverings are a bit sloppy looking now. And my hubby’s “comfy chair” is really starting to show it’s use. Love your laundry room! What a difference a few changes can make. I would love to make over our living room. Way too formal and hardly used I would like to transform it to an comfortable elegant space that we could use for reading, relaxing and entertaining. Not necessarily in that order. Love, Love, Love your laundry room.. My laundry room is my summer project this year. My washer and dryer have been with us for around 15 + years now. The dryer well, lets just say I think he has about had it. Weird though how you get an emotional attach to the things. As I type this and think about it, it has been washing & Drying my babies (not so much babies anymore) clothes all his life. I could through about any room in a hat and choose for a re-do. Priority would probably be my kitchen; odly, it’s what sold me on the house to begin with…now I can’t wait to rip it apart. The TV/media room would be the next choice. I hopped on here looking for laundry room ideas and I must say, your Laundry Room is FABULOUS! What a great use of space and awesome amounts of storage. I like it a lot! I love the laundry room, but it’s not where I’m trying to go! On your home page, I’m clicking on the picture and link for the Masther Bathroom & it is bringing me to this page instead! I love love the cafe shelves in the laundry room!!! Especially since we are in the process of redoing our small laundry room. I was wondering how you attached the shelves to the wall? Did you use screws? If so, where did you secure them? Planning on shopping around for the exact shelf & brackets (painting them white of course) & really want them to look great! Any advice would be very much appreciated! for more link building tips. This checklist will refer to implementing optimizations in a Word – Press Blog. that there is an algorithm that is continually changing. unless of course your medication contains h – CG. utilize package that incorporates precise guidelines for implementing the merchandise.